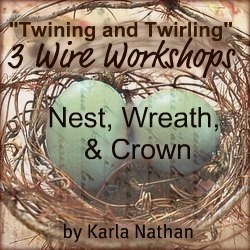 In this workshop, you will learn how to make a natural looking vine from wire. I use these techniques to make wreaths for all seasons, sweet fairy laurels for my grand daughter, big girl crowns for myself, and darling little nests of all sizes and styles. The workshop is in a blog form, and I will send you the address, user name and password for access. It will be up indefinitely, as long as I have a TypePad account. The classes will be divided into three sections, after a little bit of info about wire and tools, I'll start with the wreath. In this class you will also get down loadable pages of vintage French text to print and use for decoupaging a bird and making leaves to add to the wreath. Patterns for the leaves are included too. There will also be a section about how I make the crowns, and one about the nests. Each section will be filled with photos and instructions. The cost for all three classes is $10. You can purchase it here by clicking on the Pay Pal button below.